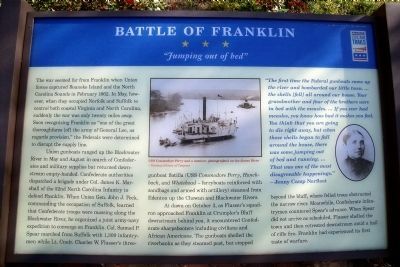 The war seemed far from Franklin when Union forces captured Roanoke Island and the North Carolina Sounds in February 1862. In May, however, when they occupied Norfolk and Suffolk to control both coastal Virginia and North Carolina, suddenly the war was only twenty miles away. Soon recognizing Franklin as “one of the great thoroughfares [of] the army of General Lee, as regards provision,” the Federals were determined to disrupt the supply line. 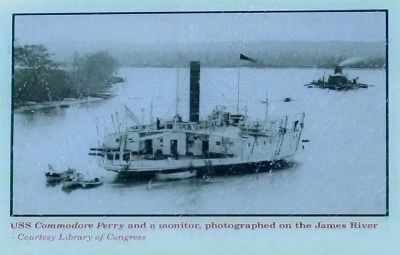 reinforced with sandbags and armed with artillery) steamed from Edenton up the Chowan and Blackwater Rivers. At dawn on October 3, as Flusser’s squadron approached Franklin at Crumpler’s Bluff downstream behind you, it encountered Confederate sharpshooters including civilians and African Americans. The gunboats shelled the riverbanks as they steamed past, but stopped beyond the bluff, where felled trees obstructed the narrow river. Meanwhile, Confederate infantrymen countered Spear’s advance. 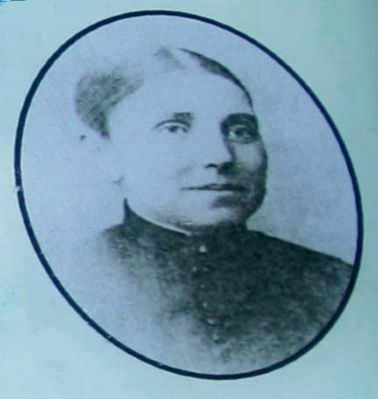 When Spear did not arrive as scheduled, Flusser shelled the town and then retreated downstream amid a hail of rifle fire. Franklin had experienced its first taste of warfare. Virginia Civil War Trails marker series. Location. 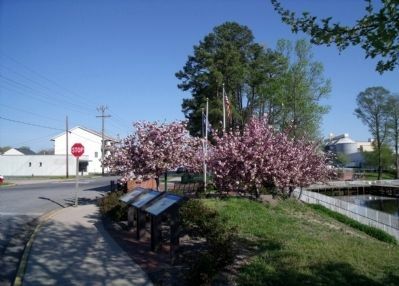 36° 40.458′ N, 76° 55.163′ W. Marker is in Franklin, Virginia. Marker is at the intersection of South Main Street and South Street, on the left when traveling south on South Main Street. Touch for map. Marker is in this post office area: Franklin VA 23851, United States of America. Touch for directions. Other nearby markers. At least 8 other markers are within walking distance of this marker. The Blackwater Line (here, next to this marker); Confederate Commissary Center (a few steps from this marker); The Barretts: A Franklin Pioneer Family (a few steps from this marker); The Age of Steam (a few steps from this marker); War Comes to the Blackwater (a few steps from this marker); "Can't Is Not in the Camp's Vocabulary" (within shouting distance of this marker); The Age of Gasoline (within shouting distance of this marker); Recovery and Progress (within shouting distance of this marker). Touch for a list and map of all markers in Franklin. More. Search the internet for Battle of Franklin. Credits. This page was last revised on July 30, 2018. This page originally submitted on April 20, 2009, by Bernard Fisher of Mechanicsville, Virginia. This page has been viewed 1,921 times since then and 14 times this year. Photos: 1. submitted on April 20, 2009, by Bernard Fisher of Mechanicsville, Virginia. 2, 3. submitted on November 13, 2011, by Mike Stroud of Bluffton, South Carolina. 4. submitted on April 20, 2009, by Bernard Fisher of Mechanicsville, Virginia.